Photographer Ben Cooper caught the total solar eclipse of Nov. 14, 2012 from a hilltop west of the Outback town of Mount Carbine, Queensland, Australia. This was to be my third total eclipse, of which I was one-and-one on clear versus cloudy viewing conditions. It takes a certain breed to be an eclipse chaser, but many do just that: travel the world for each and every solar eclipse to soak up more time in the ... well, blocked sun. They say that after you see one (and everyone needs to see one in their lifetime), you will want to go back and see another. This is just how it worked with me, having finally seen my first in 2008 under crystal clear skies. Total solar eclipses occur when the moon passes directly between the Earth and the sun in its orbit around our planet, and in which the moon is close enough in its orbit to completely blot out the solar disk behind it. (Eclipses also occur when the moon is too far to completely cover the sun, an event known as an annular eclipse, where the sun turns into a so-called ring of fire). Total solar eclipses occur about every 18 months on average in some narrow band on Earth, though some spans of time could see two or three happening about a year apart, and then none for about two and a half years. Whereas with a partial or annular eclipse, you cannot look directly at the event, during a total eclipse, there is a small window of totality — the point where the sun is completely blocked — in which observers can look directly at it. A total eclipse is a sight to behold, with the sun's corona stretching out in all directions like filaments of light, and the moon in the middle not completely black, but exhibiting an Earthly glow you can just make out. This is called Earthshine, the reflected light of Earth on the moon's dark side. Eclipses present a challenge for observers, as clouds can easily block the view. The goal for any chaser is to head to the area with the best prospects for clear skies. The November 2012 total solar eclipse, as seen by photographer Ben Cooper in Australia. For the Nov. 14 eclipse, the moon's shadow touched land only in Northern Australia. Beginning at sunrise in Arnhem Land in the Northern Territory, the shadow quickly swept across tropical north Queensland and out into the Pacific, never touching land again. Being on a boat is one option and allows some flexibility with the weather, and cruise ships frequently alter itineraries to include the eclipse. But being on land is the best choice for a photographer like myself who desires steady ground for his cameras. For this eclipse, experts were predicting about a 66 percent chance of clear skies in Queensland, either on the coast or inland. When I arrived in the tropical coastal town of Cairns two days before the eclipse, I was met with on-and-off drizzle, and a mix of sun and clouds as showers hugged the coastline but gave way to blue in between. It was not looking good as a whole; at best it was looking like a hit-or-miss experience on the coastline. I had planned to observe at an aptly named town called Palm Cove, on the ocean, where I hoped to photograph the eclipse with a nice foreground of water and palm trees. But 24 hours before the eclipse, I had a tough choice to make: Give up my plan and head inland, where the chances of good weather might be better, or take my chances with the coast. A quick view of the visible satellite imagery from a specialty weather website gave indications that all was clear inland, and that these showers were confined to the coast that morning. In the previous week, there had been just one really clear day in Cairns, I had been told. The decision was made: Inland I would go, but where? Anywhere away from the clouds would be an improvement. With a guide and a car, my companions and I headed inland, which is not quite as the crow flies when in a vehicle. We drove about 150 miles inland (though only perhaps 50 miles from the coast) toward the Tablelands towns of Mareeba, Mount Malloy, Mount Carbine and beyond, toward another place called Palmer River. As we did so, the obvious line of clear skies seemed to keep withdrawing farther away from us; the clouds themselves were headed inland as well. Well, my luck held, and that's just what happened. We had a nervous dinner at a café in the rainforest at sunset, and within an hour of sundown, the clouds were gone in every direction. Things were looking up. After dinner, we headed back to the remote hillside, about halfway between Mount Carbine and Palmer River, in the dark. Up a dirt road into the Bush, as they call it, we went. 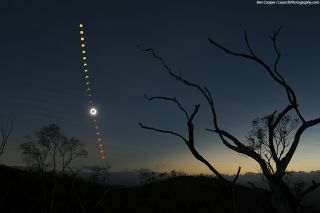 This composite photo, taken by Ben Cooper in Australia, shows the evolution of the November 2012 solar eclipse from partial phases to totality. A few other cars were also there, waiting for the eclipse some nine hours away. We pulled into a spot between two trees, shut the engine off, and waited under a star-filled sky. I tried to sleep, but that's always hard in these situations. The tension was great. I drifted to sleep, and awoke again around midnight: It was overcast. I shut my eyes once more and hoped for the best, and as dawn came, so did the sun. On the horizon toward Cairns, thick coastal showers were rolling beyond the coastal mountain range. But here in the outback, it was all clear. And it would remain that way, as the 20 or so groups gathered here were treated to one of the greatest spectacles in nature at 6:38 a.m. local time. When we returned to the coast to explore the rainforest, eclipse viewers and locals we met all had the same descriptions. "We saw totality for a few seconds, but most of the eclipse was behind the clouds." "It was clouds until right before totality, and then it miraculously cleared! We were lucky." Some were clouded out, but many caught a good view. It was certainly hit or miss. Had I stayed in Palm Cove where I wanted to see it, totality would have been clear, but the partial phases would not have been. I would not have gotten my multiple-exposure sequence, or had any sets of partial phases to post. Looking to see to a total solar eclipse yourself? The next one occurs in November 2013 on a very thin band (so thin that it's annular at one end, designating it a hybrid eclipse) in the mid Atlantic Ocean and central Africa. But this will be a short one; about 90 seconds at its greatest in the ocean off east-central Africa, and only some 9 seconds long at the sunset end of the track in Kenya and Ethopia. The next full total solar eclipse isn't until March 2015, when the moon's shadow hits ground on a band stretching from the Faroe Islands north of Scotland, north to Svalbard and the North Pole. The United States will see a total solar eclipse in August 2017, the first time one has come to the lower 48 states since 1979.